Eivind Josef Berggrav (25 October 1884, Stavanger – January 14, 1959, Oslo) was a Norwegian Lutheran bishop, primarily known as Primate of the Church of Norway and remembered for his unyielding resistance against the Nazi occupation of Norway during World War II, even though he was under isolated house arrest during most of the war. During the shock of the German invasion of Norway, Berggrav did not immediately publicly oppose the occupation, but instead initially appealed to Norwegian Christians to "refrain from any interference" and to refuse to "mix themselves up in the war by sabotage or in any other way." However, as it became increasingly clear that the occupying Nazi powers would not honor their promise to allow Norwegians freedom of religion and the preservation of their structures of government, Berggrav was a leader in forming the Christian Council for Joint Deliberation, and when the Church of Norway was ordered by the Nazis to alter its liturgical practices, Bishop Berggrav refused to comply. On 9 April 1942, Berggrav was arrested. Along with four other members of the Christian Council, he was initially imprisoned in the Bredtvet concentration camp. Berggrav was saved from execution by Theodor Steltzer and Helmuth von Moltke, members of the Schwarze Kapelle. He was moved to an isolated location in the forests north of Oslo, where the bishop was placed in solitary confinement and allowed to see no one but his guards. From this prison Berggrav orchestrated the mass resignation of almost all of the priests of the Church of Norway in protest against the Nazi tyranny. Since all the clergy of the Church of Norway were also civil servants at the time, this shunning of the orders of the Nazi government sent a powerful message to the people that tyrants would not be obeyed - no matter what the price. With the cooperation of his guards, Berggrav often left his imprisonment to meet with the Norwegian underground. As his face was well known the bishop often wore disguises, such as a policeman's uniform or thick glasses and fake mustache. In December 1944, Berggrav was featured on the cover of TIME magazine, becoming one of the relatively few protestant religious figures to have received this honor. 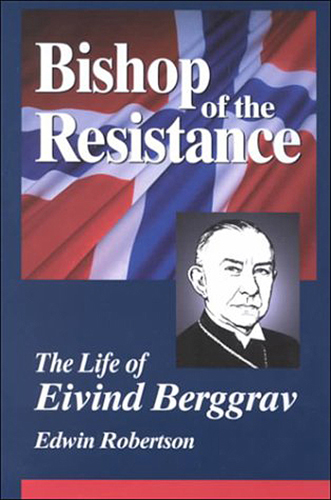 Berggrav was also an important figure in 20th-century ecumenical movements, including the Universal Church movement and the World Alliance for International Friendship through the Churches.